Major General James D. Delk of the California National Guard. During the height of the riots, Major. Gen. James D. Delk oversaw more than 10,000 troops from the California National Guard who were responsible for returning order to Los Angeles over a five-day period. And while he was a veteran of the Watts riots of 1965, Delk found that leading troops during urban maneuvers in 1992 was decidedly different. Fires had spread throughout the city over a 32-mile area from the Hollywood Hills to Long Beach and had reached a point where city, county and state police found it difficult to quell the violence. Gov. Pete Wilson called the troops in on the first night of the riot, but they were set back nearly a whole day because they initially did not have the proper equipment to deal with the rampaging crowds. In order to understand the full scope of what was happening, Delk had to spread his troops wide over the area amidst threats of snipers and gangbangers. His troops' movements had to be stern enough to return order to the streets, but careful enough to avoid further inflaming passions or harming the innocent. And he was dealing with citizens furious over a court decision that had angered an already angry community. "What helped us was standard military training," says Delk. Even with that background, two people were shot by his troops. One was a drug dealer, angry that his corner was being occupied by the soldiers; another was a man who was violating his probation and attempted to run the soldiers down. Troops were scattered across affected areas in pairs, and each soldier was given 30 rounds to use with rifles, Delk says. 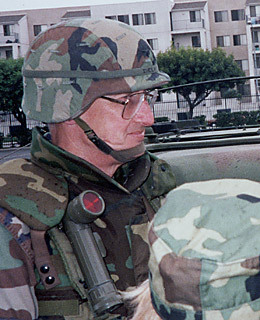 The military presence allowed police to begin making arrests, and Delk's coordination with the L.A. Sheriff began to create order in a chaotic environment. Despite misperceptions about the people of inner-city Los Angeles, the vast majority were victims of the riots rather than the perpetrators. "It took about three days to restore order, but people didn't want us to go home," he explained. "They told us it was the first time in years they felt safe just going to the market." Delk retired from active duty in 1992, several months after the riot. But he went on to become one of the most sought after authorities and authors on urban unrest. After publishing his book Fires and Furies, Delk toured the United States and Europe lecturing on his experiences in Los Angeles. Today, in full retirement, he lives quietly in Fair Oaks, Calif.